Watch and cheer from Sky Castle in Birmingham. Join us (and them and friends) for this annual ritual at Sky Castle, 2808 7th Avenue South, Birmingham, www.skycastlebham.com. Kickoff is at 11 AM (noon, Eastern). 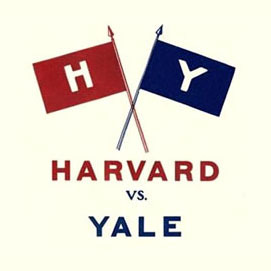 From The Crimson: "Everything to know about The Game, 2018"
When you live in Alabama and see the incredible amount of attention paid to collegiate football, especially when Alabama or Auburn play for the National Championship, you wonder about the Harvard-Yale game’s being called “The Game.” There is a great old tradition and, despite the deterioration of interest in Ivy League football, even among the students, this event at the end of each season still evokes great interest. Even the stadium itself has a place in history, as you can read in the chapters on its construction and its role as a major force in the evolving rules governing football.